The Muslims did not stay long in Medina following their return from the Farewell Pilgrimage in Mecca. The Prophet had immediately ordered the mobilization of a large army and commanded it to march on Syria. Muhammad (P.B.U.H.) sent along with that army a number of the elders of Islam, the earliest Muhajirun, among whom were Abu Bakr, Umar, Abdur Rahman bin Auf, Abu Obaida ibn al-Jarrah, Sa'ad bin Abi Waqqas, Talha, Zubayr, Khalid bin al-Walid, and many others. He then ordered all his companions, with the exception of Ali and other members of Banu Hashim, to report for duty to Usama, and to serve under him. On the 18th of Safar of 11 A.H., Muhammad (P.B.U.H.) placed the banner of Islam in the hands of Usama, a youth of 18, the son of Zayd bin Haritha, the martyr of Mootah and said: 'Fight thou beneath this banner in the name of the Lord, and for His cause. Thus thou shalt discomfit and slay the people that disbelieveth in the Lord.' Zayd had led the Muslims in the battle of Mootah against the Romans, where the Muslims were defeated and had retreated into Hijaz. Muhammad(P.B.U.H.) wanted to efface the memory of the defeat at Mootah but he was awaiting an opportune moment. Ever-since the Prophet, may Allah bless him and his Ahlul Bait, had migrated to Medina in A.D. 622, he had worked tirelessly. Ceaseless labor and lifelong austerity inevitably took their toll, and he fell ill. This illness was going to be fatal. Though he had felt weak even before his illness set in, he had not allowed weakness to interfere with his duties as the Messenger of Allah and as the Sovereign of the Muslims. The Prophet wished the army to leave Medina at once. But strangely, the army did not show any eagerness to obey him. Instead of obedience, the Prophet met resistance – from some of his companions! Thenceforth, the Prophet had to grapple with two problems; one was to overcome his illness and the other was to overcome the resistance of his army. The last few days of his life on this earth were dominated by this two-pronged struggle. The senior members of the Quraysh bitterly resented the elevation of a boy of 18 over all of them, and that too, the son, not of a high-born Qurayshi, but of a former slave! Some among them were so disgruntled at the selection of Usama as their general that they openly expressed their displeasure. The veterans did not like the idea of attacking the still redoubtable Romans with a lad, who had little military experience, as their leader. Muhammad(P.B.U.H.) was, however, unmoved by the protests. He was establishing the precedent, observed ever since among Muslims, that age and social standing do not necessarily make the best generals. He was ingraining in them the message of democracy which they were to carry to the world. The appointment of Usama as general was not, however, the only reason why some of the companions did not want to go to Syria. There were some other reasons also why they believed it was absolutely essential for them to stay in Medina, regardless of the orders of the Messenger of Allah. Usama asked the Prophet if it would not be better to defer the invasion of Syria until his recovery from fever. But the Prophet said: "No. I want you to leave this very moment." Usama went to his camp at Jorf but few of the companions came to report for duty. They knew that the sickness of the Prophet had brought a "crisis" upon the umma (community), and they considered it "unsafe" to leave Medina at a time like this though they considered it quite "safe" to defy the orders of Messenger of Allah. The Prophet had fever and severe headache but he managed to go into the mosque, and to address the assembly there which included many of the stragglers, thus: "O Arabs! You are miserable because I have appointed Usama as your general, and you are raising questions if he is qualified to lead you in war." Then Muhammad told them sharply, "You carp at him as you carped at his father, but he is just as worthy of command as his father was. I know you are the same people who had raised the same question about his father. By Allah, Usama is qualified to be your general just as his father was qualified to be a general. Now obey his orders and go." The Prophet's illness worsened, but he tried valiantly to throw it off for Usama's sake, for as word of Muhammad's sickness spread about, the young man was having a hard time recruiting his troops. Some men who had joined him, were returning to Medina, and certainly none were leaving. The rank-and-file of the army obeyed the orders of the Prophet, and reported for duty to their commanding officer at Jorf but most of the senior companions did not. Some among them lingered in the city; others, under constant pressurising by the Prophet, went to Jorf but came back. Still others returned to enquire after the health of the Prophet. There were also those companions who didn't go to Jorf at all and stayed in the city out of their "love" for the Prophet since they did not have the "heart" to leave him at a time when he was critically ill. But these protestations of "love" and "solicitude" for his welfare did not impress the Prophet himself. The touchstone of their love for him was their obedience to his commands. He ordered them to leave for Syria but they did not. They disobeyed him during the last days of his life. Eventually, the inevitable took place. Muhammad, the Last Messenger of Allah on this earth, died. His struggle to send his companions out of Medina, came to an end and the army did not go on the campaign – in his lifetime! For Muslims, every command of Muhammad (P.B.U.H.) is the command of Allah Himself because he is the Interpreter to them, of Allah's Will and Purpose. Disobedience to Muhammad is disobedience to Allah Himself. Therefore, those men who disobeyed him, earned the displeasure of Allah. The battle of Mootah was fought in A.D. 629, ending in the rout of the Muslims. The Prophet wanted to blot out that stain of defeat. But it was not until three years later – in 632 – that he ordered Usama to invade the Syrian frontier in retaliation for the disaster of Mootah. The timing of Usama's expedition raises a many questions. Why did the Prophet not send his army to Syria at any time during the intervening three years? Why did he choose the time just before his own death to send it? Why, all of a sudden, it became so desperately important for him to send his companions and fighting men out of Medina? As noted earlier, the Prophet told the Muslims on more than one occasion that he did not have much longer to live in this world. It is also reported that one night the Prophet went into the cemetery of Al-Baqi, accompanied by a domestic. After praying for the dead, he said to his companion: "They (the dead) are in a better state than those who are alive. Soon many new evils will appear, and each will be more frightful and hideous than its forerunner." On the one hand the Apostle of Allah was predicting his own demise, and was also predicting the appearance of new evils and outbreak of new disturbances; and on the other, he was exhorting his Companions to leave Medina and to go to Syria! In view of the imminence of his own death, what was more important for the Apostle to do: to seek retaliation for the death of a friend who was killed three years earlier on a distant frontier or to protect the State of Medina and the Muslim umma from the new perils which, he said, were soon going to appear? The obvious answer to this question is that if retaliation for the death of Zayd could wait for three years, it could wait a little longer, and that the security of the State and the safety of the umma, were far more important than anything else. Therefore, the Prophet ought to have deployed the army in and around Medina, instead of sending it abroad. But it appears that the Apostle himself considered nothing more important than to send his companions to Syria out of Arabia itself. When he noticed that they were ignoring his orders, he cursed them. Shahristani, the historian, writes in his book, Kitab al-Milal wan-Nihal (pg 8): "The Apostle of Allah said: 'Usama's army must leave at once. May Allah curse those men who do not go with him.'" It was the first time in his life that Muhammad (P.B.U.H. ), the Messenger of Mercy, cursed anyone. Before this, he had never cursed anyone – not even his most rabid enemies like Abu Jahl, Abu Sufyan and the people of Ta'if who had stoned him. Also, in the past, if anyone was unable to join the army, he did not press him to join, and let him stay at home. But in the matter of Usama's expedition, he did not want to hear any reason or excuse from anyone. In the last moments of his life, a man wishes that all his near and dear ones should be around him. But contrary to all norms of conduct, Muhammad (P.B.U.H.) was doing all that he could to send his companions and friends away from Medina. The Sunni Muslims claim that Muhammad, the Prophet of Islam, did not appoint his own successor, and he left the matter of choosing a leader for the community to his companions. If they are right in their claim, then the Prophet's order to the companions to leave Medina and to go to Syria, poses a most thorny problem for them. It was obvious that the Prophet was going to die and the time had come, therefore, for his companions to put their heads together and to appoint a new leader. If he had wished them to elect or select his successor through their "mutual consultation," would he have ordered them to quit Medina? Also, he himself had warned the umma that it was threatened by new perils. Would he not, therefore, want his companions to stay in Medina, and defend the umma from those perils? But Muhammad (P.B.U.H.) did not do this. He ordered his companions to get out of Medina, and he was never so abrupt with them as he was on this occasion. Could it mean that it were the companions themselves whom he saw as the authors of the new evils and perils threatening his umma? Infact, the safety and salvation of the Muslims lay in their unquestioning obedience to the orders of their Prophet. When they disobeyed him, they threw open the door to all evils, disturbances and perils. In the context of the events of the time, it appears that Muhammad (P.B.U.H.) had most important reasons for deferring Usama's expedition until the last minute. He had declared clearly, precisely and repeatedly that Ali ibn Abi Talib was going to be his successor. But he was also aware of a strong resistance against Ali's succession from his companions. The Prophet also knew that the group opposed to Ali, was extremely powerful and vigilant. 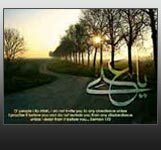 Therefore, he figured that if at his death, members of the group in question, were out of Medina, Ali would succeed him without any incident. The real purpose of the Prophet, in organizing the campaign of Usama, therefore, was to send all those men away from Medina who might challenge Ali in his accession to the throne of the caliphate. He hoped that in the absence of the companions from Medina, Ali would ascend the throne, and upon their return, they would find him firmly in control of the government. The expedition of Usama, therefore, was the prelude to the transfer of sovereignty from Muhammad to his successor, Ali ibn Abi Talib. But the companions were not going to leave Medina. To stay in Medina, they dared the Prophet himself, and even ignored his curses. They knew that if Ali once ascended the throne, then they, i.e., the Companions, would be shut out from the mansions of power forever. 1. The battle of Mootah had been fought in A.D. 629. In the summer of A.D. 632, the Syrian frontier was peaceful and quiet, and there was no threat, real or fancied, of an invasion of Medina from the north. And yet, Muhammad (P.B.U.H.) was showing the greatest anxiety to send his army to Syria. 2. Usama's expedition was organized, apparently, to restore the morale of the Muslims after their rout in the battle of Mootah, and to chastise those people who had killed his father, Zayd bin Haritha. The Apostle charged Usama with the task of exacting revenge from the killers of his father. Also, Jaafer ibn Abi Talib, the Winged Martyr of Islam, and the elder brother of Ali, was also killed in the same battle. But the Prophet did not send Ali or any other member of the clan of Hashim with the expedition. He kept them all with him in Medina. 3. Despite his fatal illness, the Prophet was urging the army to march on Syria. He brusquely dismissed the professed solicitude of some of his Companions for his welfare, and ordered them to go with Usama. 4. Usama bin Zayd bin Haritha was the commanding officer of those companions of the Prophet who were old enough to be his grandfathers such as Abu Bakr, Umar, Uthman, Abu Obaida bin al-Jarrah, Abdur Rahman bin Auf, and many others. The Prophet was thus stressing the principle that the Muslims were not to consider a man worthy of leadership merely because he was old. 5. The companions raised objection to Usama's leadership on this ground. The Prophet agreed that only the most qualified person ought to be invested with supreme authority. But he maintained that Usama was more qualified than all those men who were ordered to serve under him, his extreme youth notwithstanding. 6. The Sunni Muslims say that the Prophet consulted his Companions, and this made his government a democracy. It is true that he consulted them occasionally in some minor matters but he himself made all decisions without reference to them. At Hudaybiyya, Umar bin al-Khattab led the opposition to him when he was negotiating terms of peace with the pagans. He ignored the opposition, went ahead and signed a treaty with them. Later, Sunni jurists explained that the Prophet ignored Umar's protests because the Prophet was acting under the commands of Heaven. They are right. But the appointment of Usama as general of the army had nothing to do with the commands of Heaven and the Prophet was free to rescind his orders when confronted with opposition from the Companions. But he refused even to talk with them on the subject much less to consult them in the matter. 7. The Prophet's orders to his Companions to serve under Usama, and to leave Medina for Syria, were most emphatic. But they did not leave Medina, and he died. They, thus, realized their aim which was to be physically present in Medina at his death. 8. Those Companions of the Prophet whom he had ordered to report for duty to Usama – their general – were defying him while he was still alive. If they could disregard his orders and his wishes in his lifetime, they could just as casually, disregard his orders and wishes in the matter of his succession after his death. They put their own ambitions and interests ahead of the commands and wishes of Muhammad (P.B.U.H. ), the blessed Messenger of Allah.